This C. japonica chance seedling first bloomed in 2004. 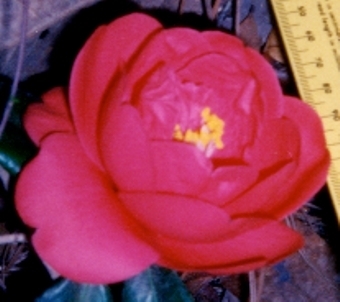 This 3 x 2" semidouble bloom with 14 petals and 7 petaloids is red with yellow anthers and white filaments. The bloom is long lasting and suitable for exhibition. Growth habit is upright with average growth rate and is suitable for landscape. Dark green, shiny leaves average 3.5" x 1.5".